When taken literally, a translation of the word ‘photograph’ means ‘written light’. 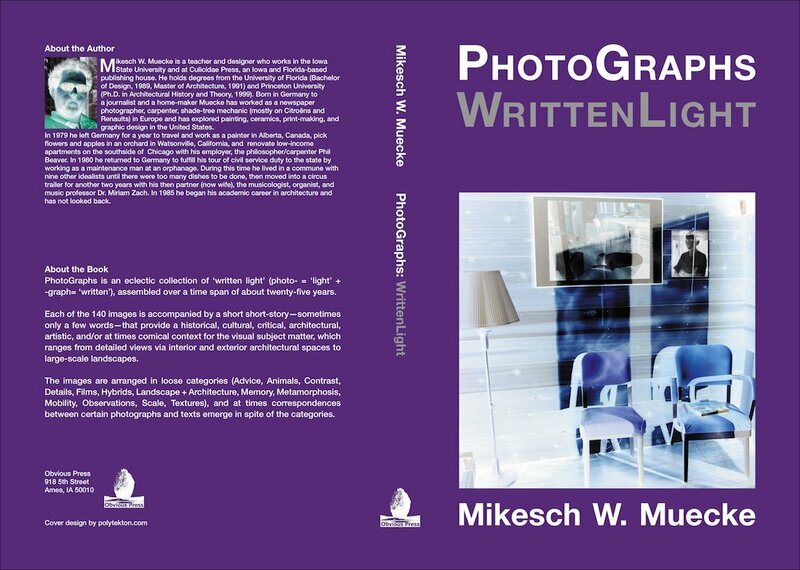 In this book Mikesch Muecke offers the reader/viewer a collection of ‘textual illumination’ divided into categories. The accompanying short short-stories—in some cases no more than a few words—are literary counter weights to the visual text. Rather than pretend to be a technophile and focus on how each image came about (aperture setting, focal length, lens type, film, etc. )—which is a conventional means of augmenting photographic images—Muecke borrows instead Roland Barthes’ take on photographs, and treats what the camera captured as something that cannot be repeated. In other words, the how of the photograph is not as important to him as what is made visible with light. Continuing with Barthes, conceptually these ‘things written with light’ are all punctum rather than studium. They represent what caught my eye over the years. Sometimes Muecke frames his subjects consciously, at other times he only realizes later the significance of a particular frame.